JCoSS student invited to No. 10! 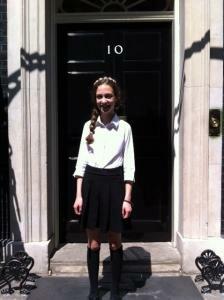 Congratulations to Orli Vogt-Vincent, Year 9 JCoSS student, who won a national writing competition from over 1,300 entries and was invited to Downing Street for her prize. “Thirteen in 13”, launched by the Anne Frank Trust UK, asked anyone turning 13 in 2013 to say how they would make Britain a better place in an online letter to the prime minister. In her letter, Orli urged Mr Cameron to allow creativity to flourish in Britain’s schools by ending the obsession with tests and targets. The contest reflected the fact that Anne Frank received her diary as a present on her 13th birthday. A panel, including Anne Frank’s step-sister Eva Schloss, selected the winner. J.K Rowling once said, “It is our choices, that show what we truly are, far more than our abilities.” But in the British school system, it is not anymore. It’s impossible to remember writing a story in school just because you actually want to, without a criteria of what you need to include to get the right levels. I can’t enjoy a subject anymore without the fear that I’m not going to achieve my target, that I’m not on track, that I’m not prepared for the countless assessments we’re bombarded with every month. Harry Potter probably didn’t fit the level criteria – billions sold. As young individuals, we are represented by a few numbers that are supposed to show our intelligence – what about things outside of intelligence? What about creativity and finding an identity? We have to try and find ourselves through numbers that sum up how clever we are. What about expressing ourselves? Where did that go? People need to listen and understand that we’re young and this isn’t necessary. I’m not saying abolish all tests – our progress obviously needs to be checked, but school isn’t just about grades – it’s about independence and exploration.